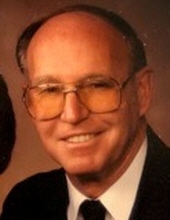 Elsinore, Utah - Dale J. Huntsman passed away peacefully at his home in Elsinore, Utah surrounded by his loving family on February 4, 2019 at the age of 88. He was born July 12, 1930 in Salt Lake City, Utah to John David and Inez Black Huntsman. He married Karma Lois Christiansen on September 8, 1948 in Pleasant Grove, Utah. They were later sealed in the Salt Lake City temple of the Church of Jesus Christ of Latter-Day Saints. They were blessed with 4 children; Carolyn, Connie, Dan, and Lynn. As a child Dale sold newspapers on the corner of Hotel Utah in Salt Lake City. The family moved to Pleasant Grove, Utah when he was 15 years old where he enjoyed farm work and began his trade as a plasterer. Dale and Karma moved their family to Reno, Nevada in 1963 and then to Las Vegas, Nevada in 1965 where Dale and Karma owned and operated Nevada Lath & Plaster until their retirement. He served as a North Las Vegas City councilman. Dale was very active in Boy Scouts of the America where he was awarded the Silver Beaver. He served in many callings in the Church of Jesus Christ of Latter-Day Saints including serving as a bishop and in the stake presidency. Dale and Karma served as mission president and mission mom of the Texas, San Antonio Mission from 1986 to 1989. They had a great love for their missionaries. Dale and Karma moved to Monroe, Utah in 1999. Karma preceded him in death in June 2002. He married IlaDean Nielson in September 2004. She preceded him in death in October 2017. He is survived by his children; Connie (Milo) Medley of Marysvale, Lynn (Beverly) Huntsman of Elsinore, his daughter-in-law, Brenda of Cedar City as well as his sister LaRae Bryant of Fillmore, and many grandchildren and great-grandchildren. He is preceded in death by his daughter Carolyn LeBaron and her husband Kerry LeBaron as well as his son Dan J. Huntsman He is also preceded in death by his parents and 3 siblings Lyman, Shirley, & Sheldon. The funeral services will be held on Saturday, February 9, 2019 at 1 p.m. at the Elsinore LDS Ward chapel. Friends may call for viewing at the Springer Turner Funeral Home in Richfield, Friday evening from 6 to 8 P.M. or at the ward chapel in Elsinore, Saturday morning from 11:30 to 12:30 prior to the services. Burial will be in the Monroe City Cemetery under the care of the Springer Turner Funeral Home of Richfield and Salina, Utah. To send flowers or a remembrance gift to the family of Dale J. Huntsman, please visit our Tribute Store. "Email Address" would like to share the life celebration of Dale J. Huntsman. Click on the "link" to go to share a favorite memory or leave a condolence message for the family.